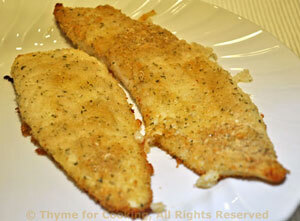 Crusted Baked Sole, quick, easy gourmet dinner. An easy dinner for the end of the week. The sole and orzo finish in the oven. 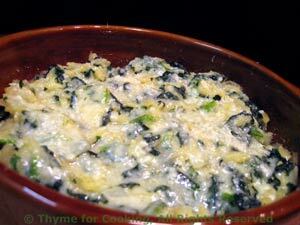 Florentine, or 'cooked in the style of Florence', means that there is spinach in the dish. Here the spinach is combined with cooked pasta and shredded cheese and baked until bubbly. In small saucepan over medium heat sauté shallots in butter for 5 minutes. Add orzo and sauté 1 minute. Add stock and herbs, cover and simmer until done, 15 - 20 minutes. All stock will be absorbed. When orzo is done add the spinach and shredded cheese. Stir well to combine. Pour into a lightly oiled glass baking dish, just large enough to hold it. Sprinkle with Parmesan and bake at 375F (190C) until it starts to brown; about 15 minutes.